Gretchen Warsen of Nashua, N.H. makes a purchase at Left Bank Books Friday morning with her daughters Meredith, 9, and Millie, 6. Bookstore owners Lindsay McGuire (left) and Barbara Klausmeyer stand behind the counter of the crowded store, which will move to a new space on Church Street in Belfast in mid to late June. 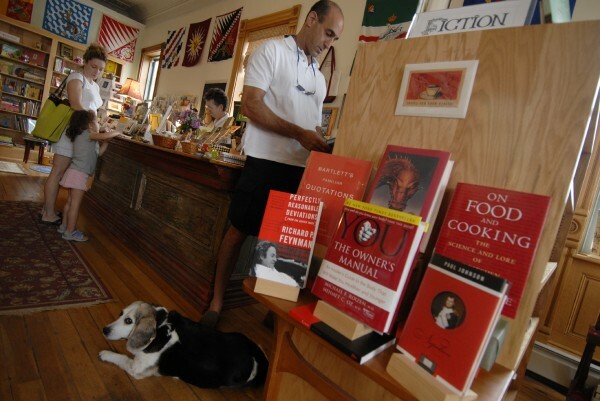 At Left Bank Books in Searsport in August 2006, Michael Medelowitz of Tampa, Fla., looks for fiction as his wife, Lisa, and their daughter Ella, 3, get a little help from store co-owner Marsha Kaplan. On the floor is Patty, Kaplan's 12-year-old beagle. 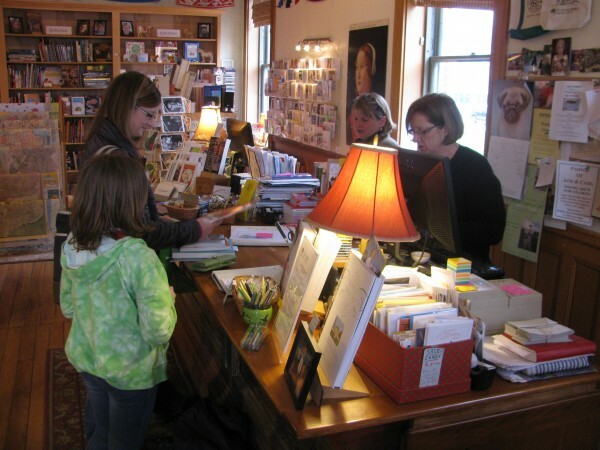 SEARSPORT, Maine — Left Bank Books in Searsport is the perfect place to shop on a rainy spring afternoon, with a cheerful proliferation of novels, nonfiction and children’s books squeezed into the corners of its snug brick storefront. But owners Marsha Kaplan, Lindsay McGuire and Barbara Klausmeyer are getting a little tired of the snugness and the squeeze. After eight years of doing business in the historic Searsport Bank Building on Main Street, the women are going to pack up their rented shop and hit the road south to Belfast. They’ll reopen in mid-to-late June in the Opera House block on Church Street, where they will have about a third more space and a regular, rectangular layout, which will allow them more room for their books and special events. Those include the store’s Winter Lyceum series, which will conclude Sunday with a presentation by former White House photographer Samantha Appleton of Camden. With the move to Belfast, Left Bank Books will join what has become a bustling, growing community of booksellers. Although Mr. Paperback, the bookstore that long helped anchor Reny’s Plaza on Route 3, closed earlier this week, other stores have opened in town in the last several years. Within a few blocks of the new Left Bank Books, there is Artisan Books & Bindery and BellaBooks on High Street and the Old Professor’s Bookshop on Main Street. Gift shop Beyond the Sea on Main Street has many books for sale, and Out on a Whimsy on High Street carries many children’s books. “Our goal is to have Belfast be known as a city of books,” said Dorothy Havey, director of Our Town Belfast. She said there already are plans afoot for the city’s second annual Belfast Bound Book Festival, which will be held on July 27, 28 and 29. Kaplan said that she had received a welcome note from Craig Olson, the owner of Artisan Books & Bindery. While they are sad to leave their 19th century building with the Mansard roof, and Searsport, the three owners of Left Bank Books are looking forward to joining Belfast’s revitalization. But the news of the move hasn’t been welcomed by everyone, according to Phyllis Sommer of Searsport, who owns Pumpkin Patch Antiques on Main Street. She described the bookstore as elegant and tasteful and an “extraordinary business” in the small town of about 2,600 people. Sommer said that the local economy in Searsport is currently shaky. Kaplan said that while she and the other owners of Left Bank Books are looking forward to making their new space as charming as they can, and starting the busy summer season with a new excitement, they’ll still depart Searsport with mixed feelings.